With SPClientSideDeployment 3.3 you can now have the file(s) published automatically on deployment from Visual Studio. 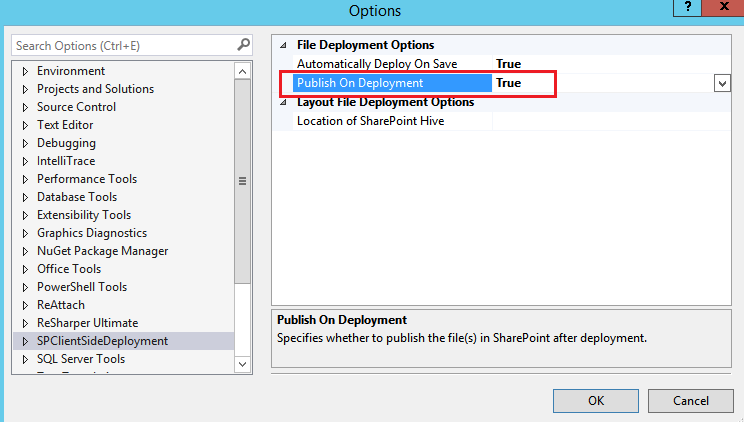 This option is disabled by default as it would require additional calls to SharePoint during deployment. To enable this option, go to Tools \ Options \ SPClientSideDeployment, and set the Publish on Deployment option to true. You can download this extension from the Visual Studio Marketplace. I hope you find this addition useful, and would love to receive feedback or suggestion. This entry was posted in SharePoint, SPClientSideDeployment. Bookmark the permalink.